Basically, you assemble a group of players (A, B, & C) who are all web comic creators. Creator A kicks it off and does a strip containing his/her characters and Creator B’s characters. Creator B is then TAGGED. He/She will do a web comic containing his characters and Creator C’s characters, TAGGING Creator C. Creator C then does a strip containing his/her characters and Creator A’s. Then the game is complete. There is not a designated lineup. The TAGGED creator can chose to TAG any of the players. No one can do a strip until they are tagged. It works out great if your next post is the TAGGING strip to keep momentum, but it’s okay if you already have plans and need an extra post or two to TAG the next player. More than that and the game lulls. For Round 3 we are adding one more dimension. No more of that Hippy-infested Willy-Nilly do whatever pleases you. This time we will try to keep a plot-line…ish kinda a thing to Web Comic Tag. For instance, if Creator A’s strip included Hipster Zombies, then Creator B must continue the line with Hipster Zombies. Now this doesn’t necessarily mean that Hipster Zombies have to continue through all strips. Creator B can kill off Hipster Zombies, but must leave something for Creator C to continue. This way the game can be read as one story line per se. Now are we gonna stick Hard and Fast to this rule. Of course not, we’re hippy-infested cartoonist, but it might be fun to see where this rule takes us and where we end up. Besides, I believe it adds a bit of a challenge to the game, should be more enjoyable to readers who live to follow Web Comic Tag (thousands upon thousands) and in the end make us regret we ever signed up for Web Comic Tag Round 3 (#TagR3). Tweet me, or leave a comment here if you need any clarification. This was brought to my attention after posting: There is not a designated lineup. Creators can TAG whoever is left untagged until all players are Tagged. Bueno! I’ll be sure to stop by. 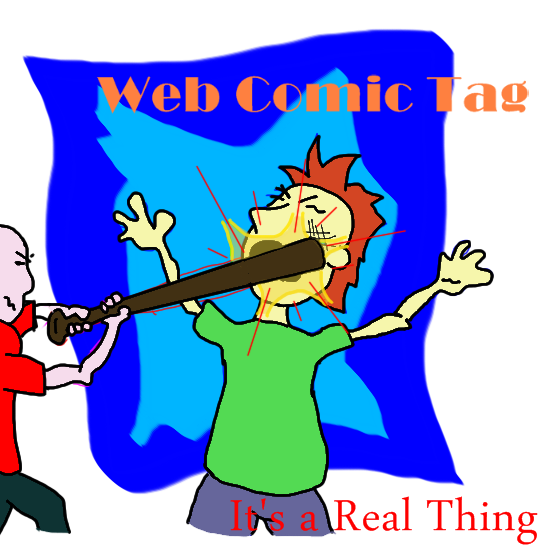 Love the pic for WebComic Tag (it’s a real thing). Thanks friend. Hey, got an easter egg for candy trip in tonight’s comic. Be sure to tune in. this is a great idea. can’t wait to read the result. Point of clarification… in round one we just tagged anyone that was still on the “untagged” side of things is that still how it works? So citing your example could creator A tag creator C, C tags B, B finishes with A? yeah, there won’t be players designated or anything. I should have said that. Crap. I hope it’s not jumbled all up. What I’ll do is let some of us VETERAN TAGGERS start it this time.